A Manitoba company is about to start a micro-refinery that will turn our province's waste oil into diesel fuel, the president and CEO says. HD-Petroleum will be at the this week's Centrallia convention — a gathering of more than 700 international entrepreneurs — to promote the technology. 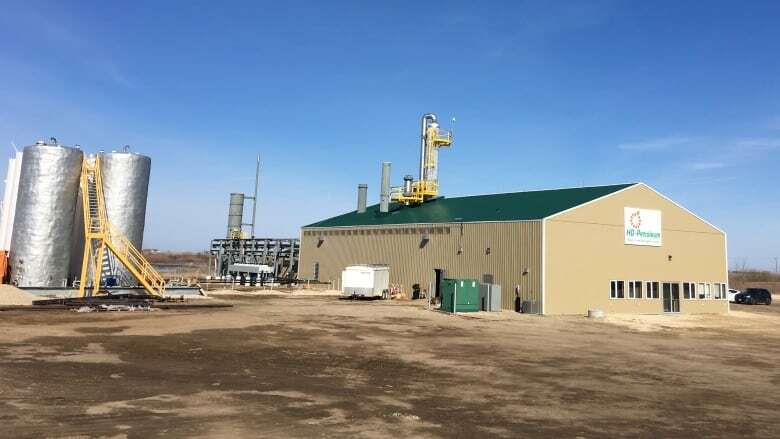 A Manitoba company is about to start a micro-refinery that will turn the province's waste oil into diesel fuel. HD-Petroleum will be at the this week's Centrallia convention — a gathering of more than 700 international entrepreneurs — to promote the technology. The micro-refinery units, called RG1s, will also be sold all over the world. The equipment is about the size of a tennis court and about 50 feet high. HD-Petroleum's technology pre-treats and prepares feedstock, refines feedstock and filters the diesel fuel. CBC's Ismaila Alfa spoke about the technology with Todd Habicht, CEO and president of HD-Petroleum, on Wednesday. Ismaila Alfa: What kind of emissions are produced in the process of converting waste oil to diesel fuel? Todd Habicht: It's less than zero emissions depending on how you do the calculation. If you're looking at your greenhouse gas emissions, it's a very substantial reduction [compared to] the traditional method of disposing of waste motor oil, which is burning it. We have effectively zero emissions from the process. However, to provide us the thermal heat that we require, there are some emissions that come from those burners, but they are very minimal. Why have we gone so long as a fuel-dependent society without recycling oil? There has been technology around since the 1960s that does recycle waste motor oils into a product called base oil. However, that technology is: one, dated; two, it has struggled to stay caught up with the crude, the verging base oil industry as far as the quality of the product goes; three, only the major population centres can support technology and so the waste oils that are in outlying regions just goes unused or it's burned. What impact will these units have? We'd like to think they'll have a very significant impact from the environmental standpoint, because the improper disposal of waste motor oil is extremely hazardous both to the air quality and fresh water. The second area it will impact is job creation within a region. The third area would be a locally created source of energy. Where will the unit in Manitoba get the waste oil? The waste oil is used oil from transportation, heavy industrial equipment and the manufacturing industry. Manitoba has a proven capacity for collecting 15 million litres of waste oil annually, and we would have the ability to process about three-quarters of that. Predominantly the oil has been exported out of Manitoba. There have been some uses in Manitoba as an industrial burning fuel. How much waste oil is there in Manitoba? Manitoba collects well over 15 million litres annually. We're no worse than anywhere else in the world. At best, the sites in the GTA and Vancouver only have the capacity to recycle about 18 to 19 per cent of Canada's waste motor oil. In Manitoba, there's effectively zero recycling unless you consider burning it as a method of recycling. The emissions that come off of it are extremely harmful. How much waste oil will the RG1 unit convert into diesel fuel? What will the unit in Manitoba look like? Our first commercial unit is scheduled for commissioning in the tail end of June. It's located in our research and development centre that's on the Manitoba Hazardous Waste Management Corporation property on the corner of Highway 75 and 14.